The 2022 World Cup in Qatar could be moved to winter if medical reports show summer temperatures in Qatar would be dangerously high, a senior Fifa official has admitted. Football's world governing body has always maintained that Qatar would have to make the request to move the tournament. But speaking at the meeting of the International Football Association Board - the body that governs the laws of football - in Edinburgh, general secretary Jerome Valcke became the first senior Fifa official to say the event could be moved if they receive strong medical advice that it needs to do so. He said: "Maybe the Fifa Exco [executive committee] will say based on medical reports or whatever: 'We really have to look at playing the World Cup not in summer but in winter.'" 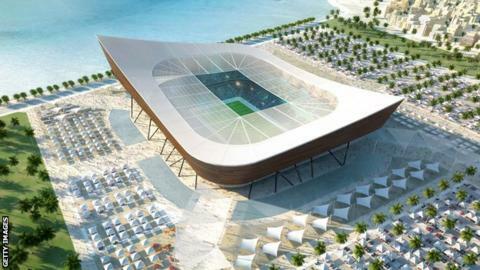 Can Qatar host a summer World Cup? The idea to move the competition away from its traditional start date in June - when temperatures in the Middle East can reach 50C - has previously been backed by Uefa leader Michel Platini and world footballers' union FIFPro. Fifa president Sepp Blatter has given varying views on the issue. In January 2011 he said he expected the competition to begin in the winter, but he then backtracked on that comment a month later. To allay possible health fears, officials from the emirate have also said that they intend to use air-conditioned stadiums and are researching the potential to create artificial clouds. It has previously been argued that any decision on moving to a winter date would have to be made by 2014 in order to give national leagues and competitions sufficient time to reorganise their calendars. However, Valcke believes that the timeframe for any decision could be extended to 2015. "I am not saying that the case is closed but what I'm saying is as long as we have not fixed the international calendar all alternatives are open," he continued. "I can tell you there is no working group within Fifa thinking and working on what it means to move the World Cup from summer to winter for the time being. "The international calendar has been agreed for 2015 to 2018, meaning that we kept open all potential for the period 2019 to 2022. We have time. "I think it would be good to have a final decision about when this World Cup will be played and have an agreement between all the football family, but it's in 2022, nine years, and we have two World Cups to organise in Brazil and Russia, so there is some time." Read more on Can Qatar host a summer World Cup?